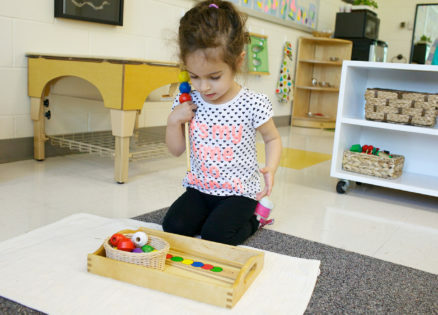 Our Montessori Toddler program is designed to meet the developmental needs of children who are 25 months by September 1. Through work with concrete materials and meaningful experiences in a carefully prepared environment rich in beauty and language, young children develop within themselves foundational habits, attitudes, skills and ideas essential for a lifetime of creative thinking and learning. The opportunity for children to develop their independence, refine their skills, strengthen their confidence, nurture their curiosity, create a sense of community and establish a love of learning, in a place in which they feel well cared for and loved, is invaluable preparation for our 3-6 classrooms. 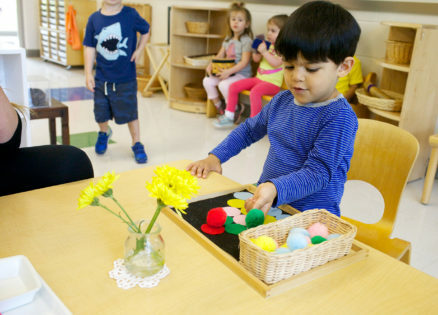 Our Montessori Toddler Program is offered two, three or five mornings a week from 8:45am to 11:30am. If your family requires additional care, children may stay until 3pm in the same environment with a small group of friends for lunch and a restful nap. Additional care is provided until 6pm in our After School Program.